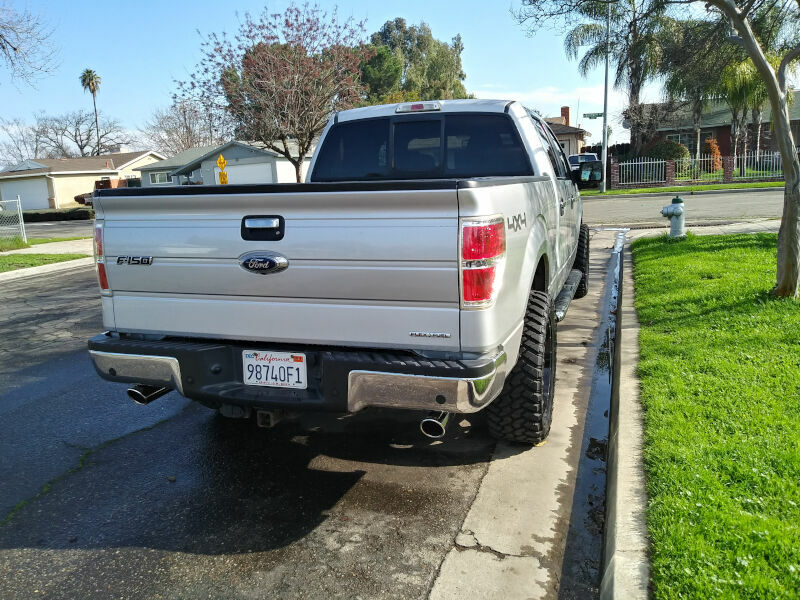 The Borla ATAK Cat-Back exhaust is Borla's loudest, proudest, and most aggressive system they have for the F150 5.0L trucks. 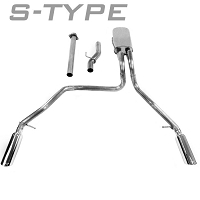 This mean exhaust kit lets your powerful 5.0L truck sing at full volume with a deep, muscle-car like growl that lets the whole town know you're packing something extra. 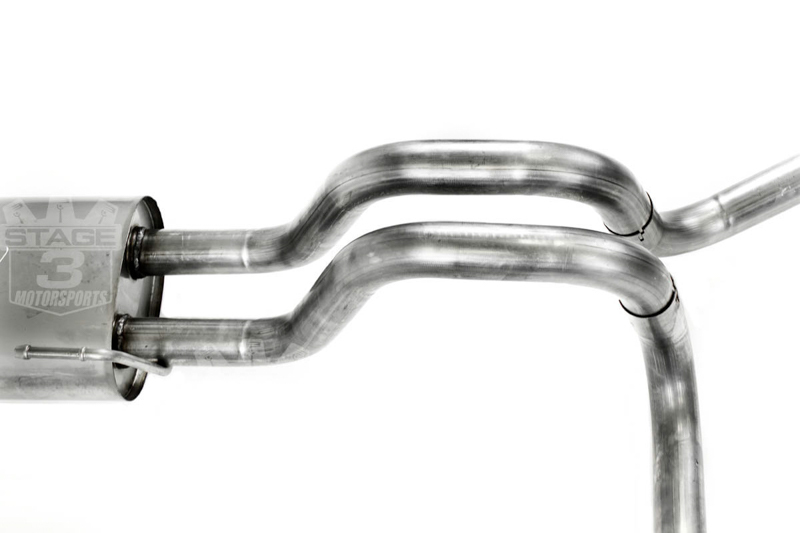 On top of the amazing new sound, the Borla ATAK cat-back system reduces back pressure with its mandrel-bent tubing and high-flow multi-core mufflers to give your truck some extra horsepower and torque. 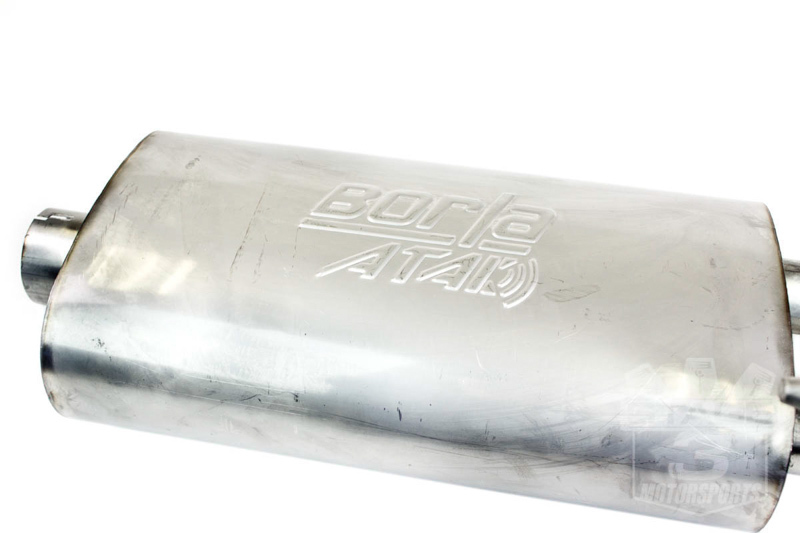 The Borla ATAK system is one of the best ways to add a race car growl to your truck in practically no time at all. 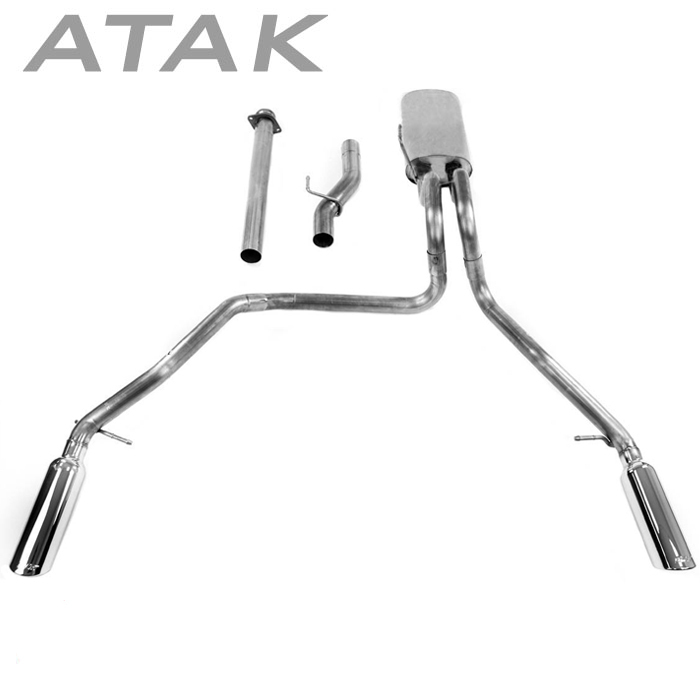 The ATAK F150 5.0L Cat-back exhaust kit gets it's immense sound and vicious roar from it's aggressively-designed mufflers. 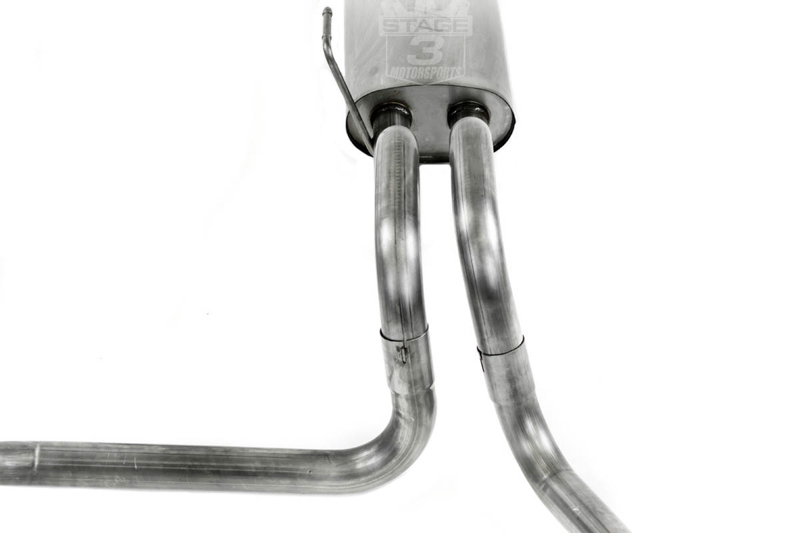 Each muffler has a multi-core internal structure similar to those found in professional racing applications. 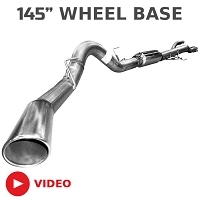 The unique design allows for excellent exhaust flow and acts as a resonator to produce an extremely aggressive not that's louder and deeper than Borla's S-Type Cat-Back System and completely blows away their Touring Cat-Back exhaust kit. Topping it all off is the ATAK kit's awesome split-exit design with 4" rolled, angle-cut tips that give your truck an impressive look on top of the great sound. 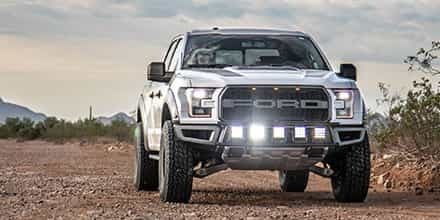 Every ATAK F150 5.0L cat-back exhaust kit is manufactured with both quality and fitment in mind so that you don't have any hassles after the system arrives at your door. The entire system is built sing high-quality 300-series austenitic stainless steel that's almost completely resistant to corrosion and discoloration making them effective in just about any climate. These kits are all put together using computer-controlled CNC mandrel bending that ensures excellent fitment. 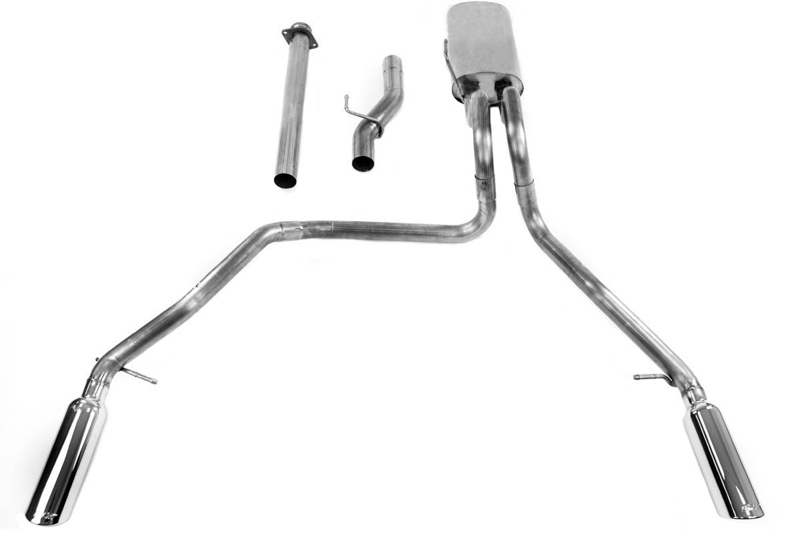 This cat-back exhaust kit deletes your factory resonator for a more aggressive tone. Wheelbase Fitment: 2011-2014 Ford F150 5.0L V8. This Borla cat-back kit will bolt-on to trucks with a 145" wheelbase (Standard Cab w/ 8' Bed, SuperCab w/ 6.5' Bed, and SuperCrew w/ 5.5' Bed). All other wheelbases will require modifications to this kit for proper fitment. Call 1-877-578-2433 for more information. Warranty Info: BORLA stands behind every system with a Million-Mile Warranty. 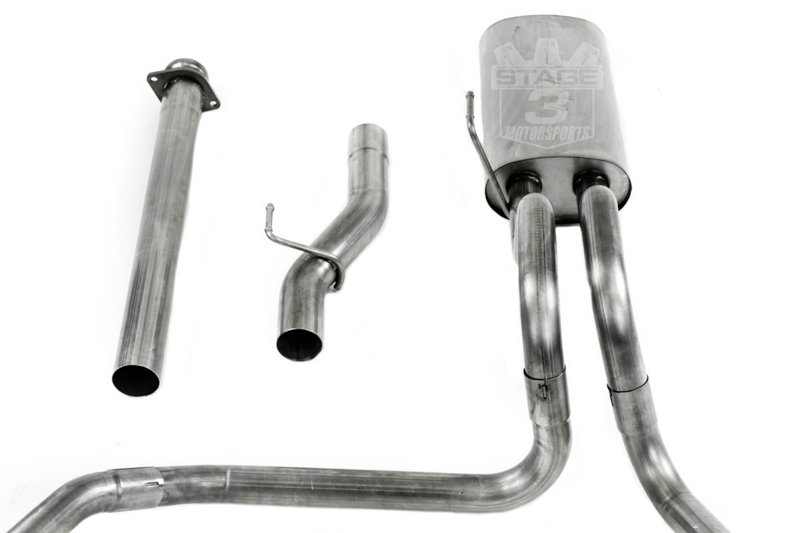 Check out our install guide for this cat-back kit on our 2012 F150 5.0L FX4 Project Truck! Just installed, and glad I went with this over other systems. Incredible sound, with no drone at any highway speeds. Fit and finish was great, would highly recommend this to anyone with a 5.0 F150. I have had this exhaust on my truck for close to a month now. 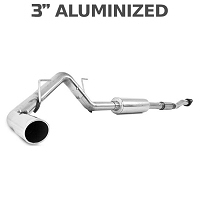 I must say it is everything I was looking for in an exhaust. 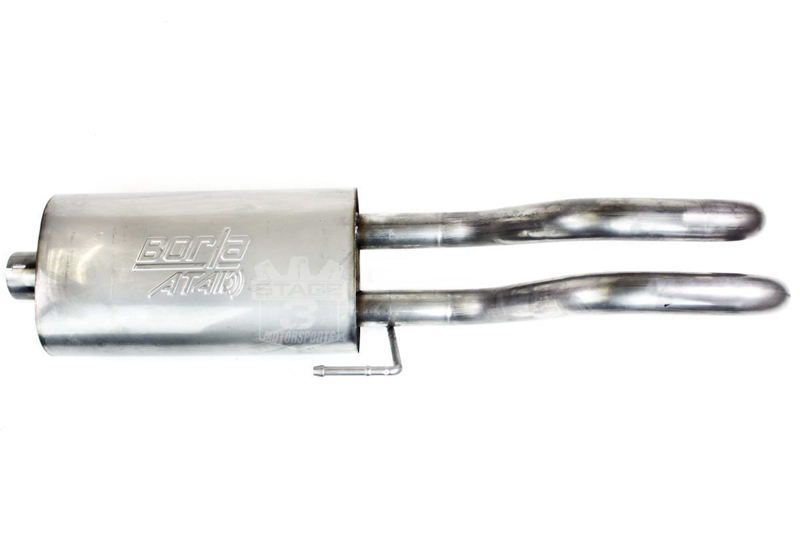 If you want an aggressive sound for your 5.0L under wide open throttle but don't want it obnoxiously loud at idle then the Borla ATAK is the exhaust for you. Now don't be fooled, there is minor drone at highway speeds. For example at 70 MPH you need to turn your stock radio up to right around 15 to not really hear the exhaust anymore. 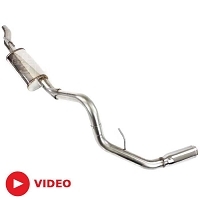 If you are looking for an exhaust that doesn't drone at highway speeds then this exhaust is not for you, but if you want an aggressive sound at wide open throttle but something that wont wake up your neighborhood coming home at 1am in the morning, then this is for you! One last note the installation is extremely easy, and if you have access to a basic tool set you can install it with no fabricating. Everything came with the kit, although the directions were a bit lacking. Just installed this Borla kit on my truck 3/18/14. It's exactly the sound I was looking for. Very aggressive when you get on the gas but won't give you a headache while cruising. The internet videos don't do it any justice IMO. Great exhaust system! What can I say the reviews that I read about this product just don't do it justice. I love the sound it has a very deep tone and is exactly what I was looking for!!! There is no cabin drone while in sixth gear cruising down the interstate but let me tell ya when you bury your foot in her she lets everyone around you know your there. I love Borla of all exhaust and I would truly recommend to any vehicle owner with a true 5.0 pony under the hood!!!! This is a very aggressive toned exhaust. I chose to do the resonator delete. It sounds very mean when you get on the throttle, yet very quiet at cruising and idle. It's almost too loud for my liking, but it does sound pretty badass. There is not another exhaust that sounds like this. In the cab, no drone, no headaches. As far as quality-- the product looks and feels great. Borla did a great job manufacturing a quality system. Crazy awesome sound. If you are looking for something to wake your truck up, this is is. Took about 2-3 hours to install, pretty straight forward. The pipes dont line up exactly, but I can live with it. The ends are not drilled out either. I called Borla, and said that it comes with a lifetime warranty, so worry not about any side effects from that. This product is load and turns heads, but at a standstill is hardly heard from the cab. I drive 70-80 miles a day, not enough drone for me to complain. Amazing. Amazing. And amazing. Did I mention amazing? Let me say this system is badass! I was on the fence/worried it would be too loud....guess what it is and in a good way!! The interior resonance is lower than my previous mbrp system compared to this one. Don't get me wrong there is some resonance just not as bad as one would think. The exterior is insane and does sound VERY good. I recently installed an S&B CAI from these wonderful people and that'll open up your 5.0 just that much coupled with this system. After you do that buy a pedal commander and you're set! The mbrp just lacked the exterior....I'm a V8 sound. This covers that and then some. Leaving the neighborhood at 6am makes me cringe but if your light on the gas it will be on the quieter side. Now on the other hand if you have lead in your foot as I do you'll be grinning ear to ear ever time you hammer down on the pedal! Just buy it from here and install it and enjoy! I do!!!! Hi its says its for the 5.0L but will it fit my 6.2? I cant find the atak anywhere for my truck. Borla does not offer the ATAK system for the 6.2L engines. Was this answer helpful? 4 of 7 Found Helpful. 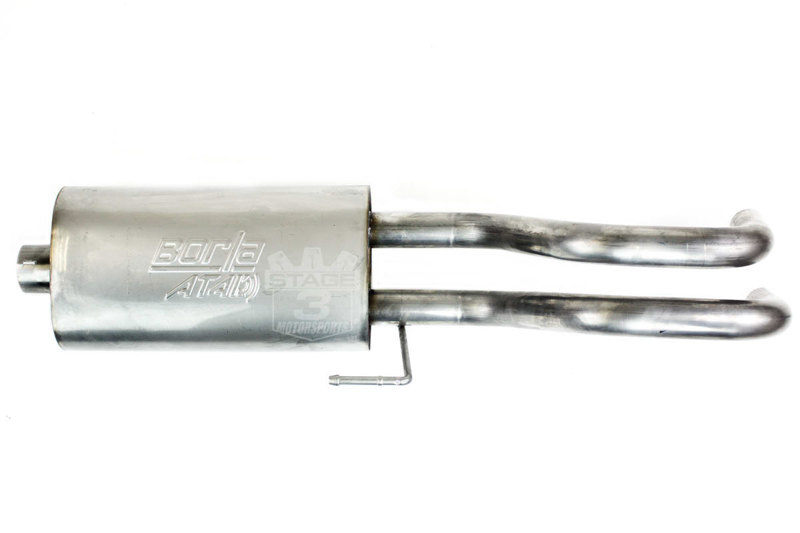 Will the Borla atak exhaust void my warranty, what if I add a tuner? 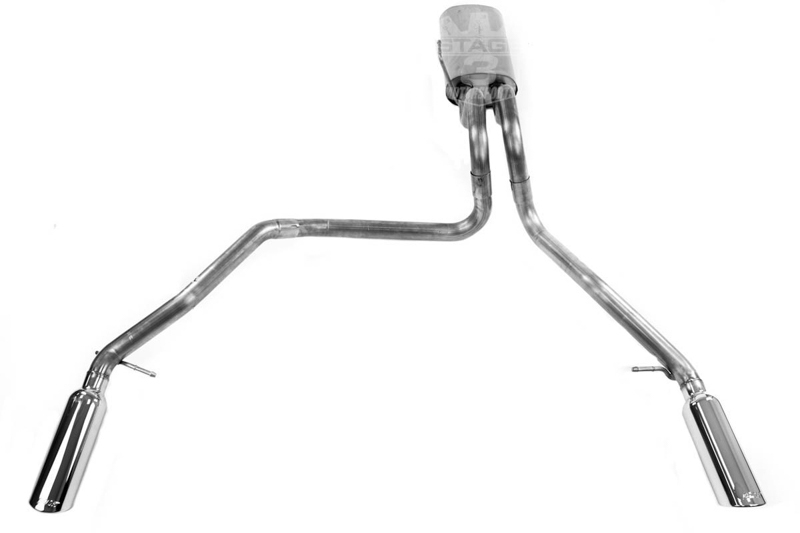 A cat-back exhaust system alone will generally not have any effect on your warranty. Adding a custom tune can absolutely result in Powertrain repairs not being covered under your vehicle's warranty. Was this answer helpful? 4 of 4 Found Helpful. Do you guys prefer the Borla Atak's or the Flowmaster Outlaw's more? Are they both in the same decibel range? If not, which one is louder? Personally, I liked the ATAKs more than the Outlaws, just because they were a little more tame and had less drone. Bill, Lou, and some of the other guys loved the Outlaws due to the fact that they were noticeably louder and came with better tips. I'd say the Outlaws are the louder of the two, though I don't have specific decibel numbers. I want to buy the exhaust but need to know, you guys export to Angola, Luanda (Africa) if yes how would me everything and how soon? You're best bet is to use our International Checkout option on checkout page when you order. Unfortunately, availability of this kit has been hit or miss as of late. Combine that with whether you have a freight forwarding company/air cargo/or whatever other shipping method you have in mind, you may not see the exhaust kit for many weeks. Call us at 1-877-578-2433, if you still need help. We're roughly 8 hours behind Luanda and open at 0830. What size of piping is in the BOR140417 kit and how much HP does it add to a Ford 5.0? 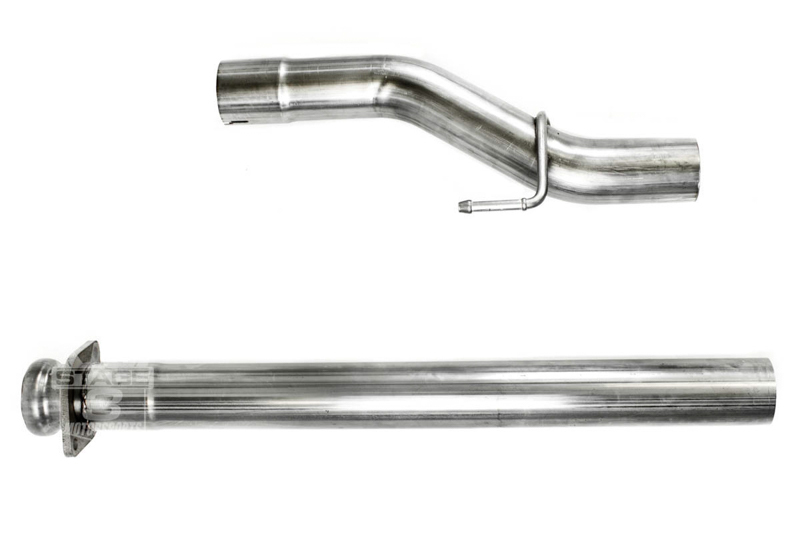 The Borla ATAK kit is 3" tubing from your mid-pipe to the muffler, and then 2.25" tubing from the muffler to the tips. 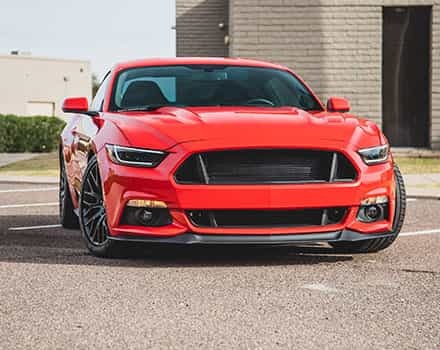 Power gains are probably a maximum of 5-10 horsepower at the crankshaft. Does this kit work with or without removal of the resonator? Drone? This kit comes with an inlet tube that deletes your F150's resonator. There is some noticeable drone while cruising, but none at idle. 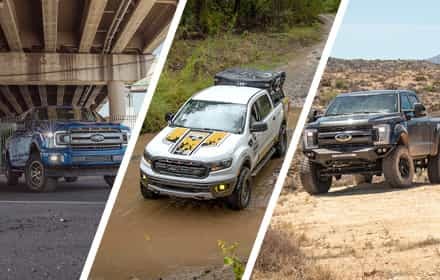 If you're looking for a Borla kit with low drone, then the F150 5.0L S-Type Kit may be a better option, especially now that Borla redesigned the kit so that it comes with an ATAK muffler and a replacement resonator, instead of an S-Type muffler. Was this answer helpful? 1 of 2 Found Helpful. 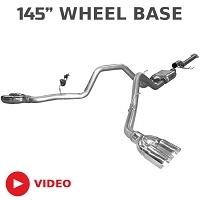 Will this kit fit a single cab, mid-bed (126" wheelbase) truck? If not, what modifications are required? This kit will not directly bolt-on to your truck. Frankly, we've never modded one of these kits to fit, so this is just speculation. You would first need to trim the inlet tube by a large extent. You may need the over-axle tubes rebent or adjusted to get around the axle and spare tire properly. You could possibly also need the driver's side hangar relocated. You may need other hangars relocated as needed. A decent exhaust shop should be able to get it to work, but it may take some labor time. 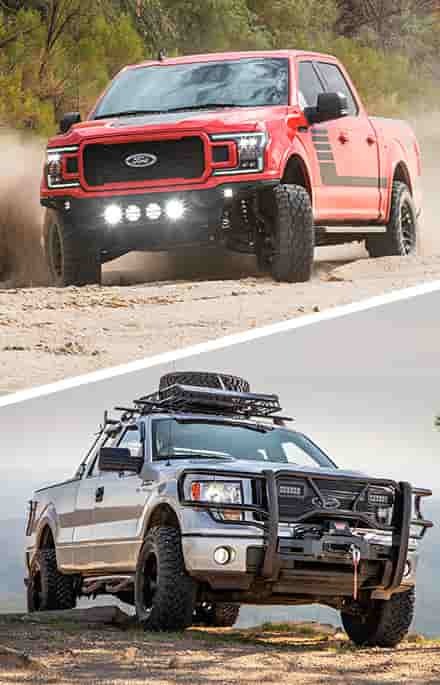 I am planning on getting these or the Flowmaster Outlaws but which exhaust sounds better and has a deeper tone in the cab with the windows up? "Better" is pretty subjective, but the Flowmaster Outlaw kit is much more aggressive and loud than the ATAK system. That being said, I think the ATAK system has a deeper tone and is much more bearable during long drives. Hi I want to know if the borla atak fits 2011 f150 limited 6.2l thank you? 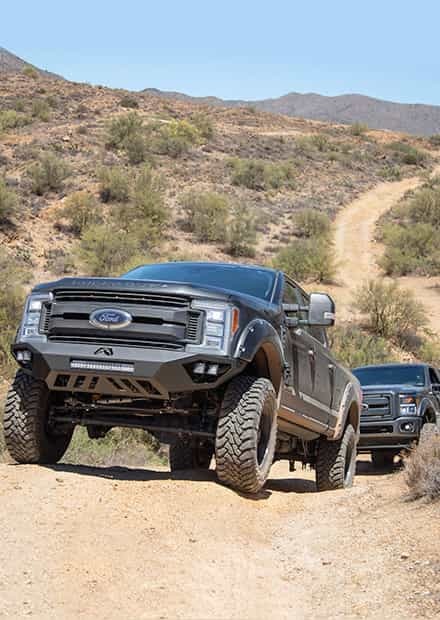 This kit will not fit F150's with a 6.2L V8 without custom modifications. I love the sound of this kit but do you guys know if it will fit with a hellwig rear sway bar #7705? 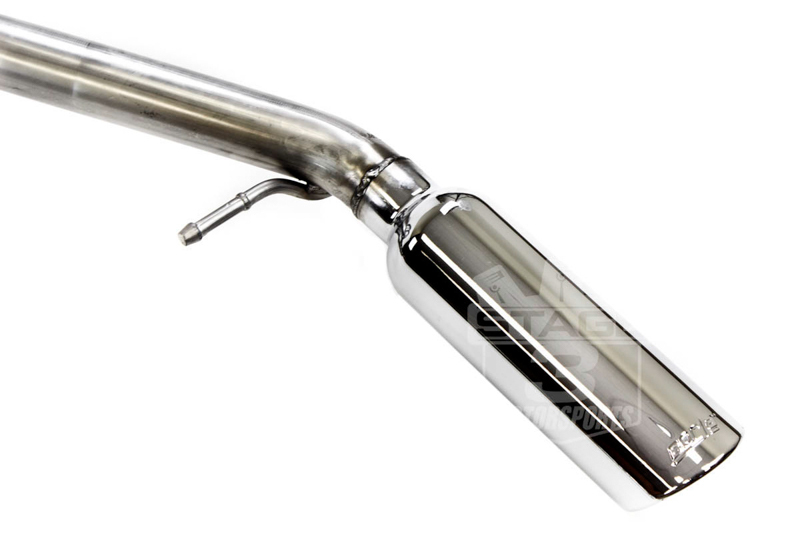 Unfortunately, we can't guarantee fitment of this exhaust with the Hellwig kit. The issue is that Borla's kit has their crossover tube for the driver's side come past and down by the rear end diff cover, meaning that there's a possibility that there could be contact with the Hellwig. 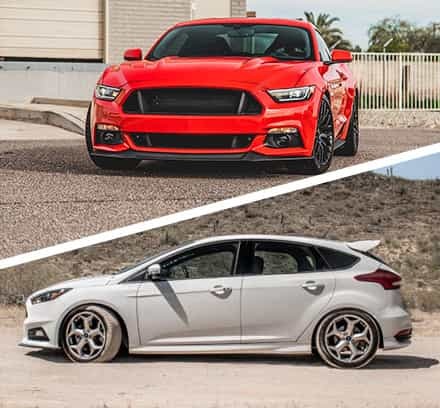 That beign said, eyeballing the positions of the two doesn't look like there would an issue, but we can't guarantee fitment, given that we haven't personally done it. You can try calling Hellwig and seeing if anyone has made it work, or you can get the kit installed at an exhaust shop, would should be able to make any modifications needed to the exhaust kit to make it fit.